This is it. The new Ferrari. And it's not called the Ferrari F620 GT. No, it's named the F12berlinetta. Yes, that's all one word. Whatever. Everyone's just gonna split those up and call it the "F12 Berlinetta." Or they'll call it the "F12." But who cares what it's called? We don't. All we — and you — should care about is that it's the fastest Ferrari ever built. Ferrari F620 GT: First Photo! 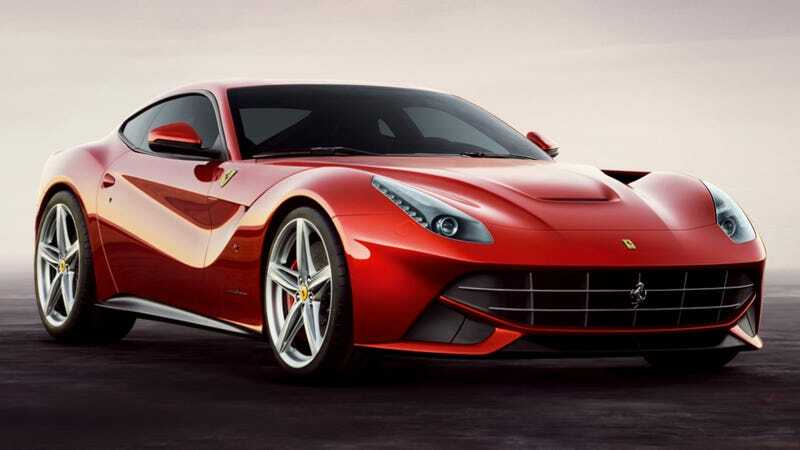 Revealed for the first time moments ago on Ferrari's web site, the new F12berlinetta is, thanks to its new generation 12-cylinder engine, producing 730 HP at 590 lb-ft of torque on a 8,700 RPM limit powerband. That brilliantly powerful engine is mated to an F1 dual-clutch transmission. The F12berlinetta's tech specs are enhanced by Ferrari's latest generation carbon-ceramic brakes (CCM3) and the latest evolutionary leap of Ferrari's magnetorheological suspension control system (SCM-E). As has now become de rigueur with all Ferraris, its control systems (E-Diff, ESP Premium, F1-Trac, and high-performance ABS) are all fully integrated. All of this combines to allow Ferrari to claim that the latest prancing stallion has a 0-to-62 time of just 3.1 seconds. The new Ferrari lapped the Fiorano circuit — which I think most horse-lovers would call the Nurburgring of Ferraris — in just 1' 23", faster than any other Ferrari road car. The exterior design — the result of a collaboration between the Ferrari Styling Center and Pininfarina — is designed to provide the F12berlinetta with "exceedingly high aerodynamic qualities." Simultaneously, Ferrari claims a very usable interior space with a cockpit designed around the driver and "additional luggage capacity" behind the seats. No word on how large of a soft-sided briefcase you'll be able to fit there. OK, so that's it — now, more importantly, what do you think? Is the new Ferrari hot or not?